Just where the heck isStealthPuppy when you need him? 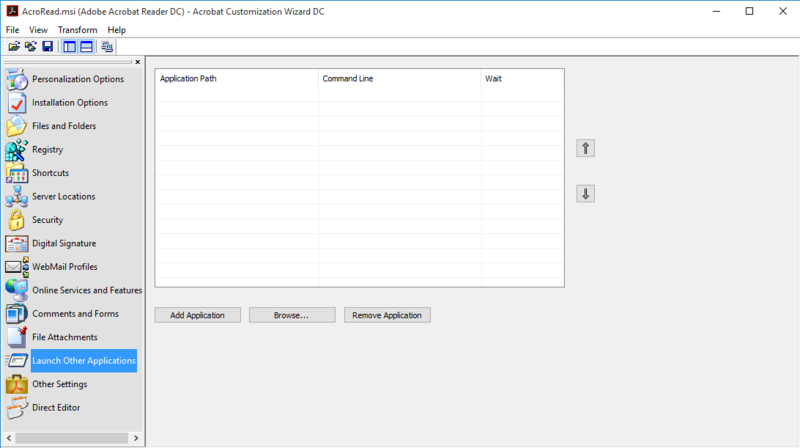 Somebody has to talk about Adobe Acrobat Reader DC and App-V. At times it has been hard to sequence Adobe Reader, but these days you can almost do it while sleeping. OK, so I’ll take a shot at writing about it because old posts make it sound so hard. First off, let’s be clear that I am talking about the free product, not the Pro version. 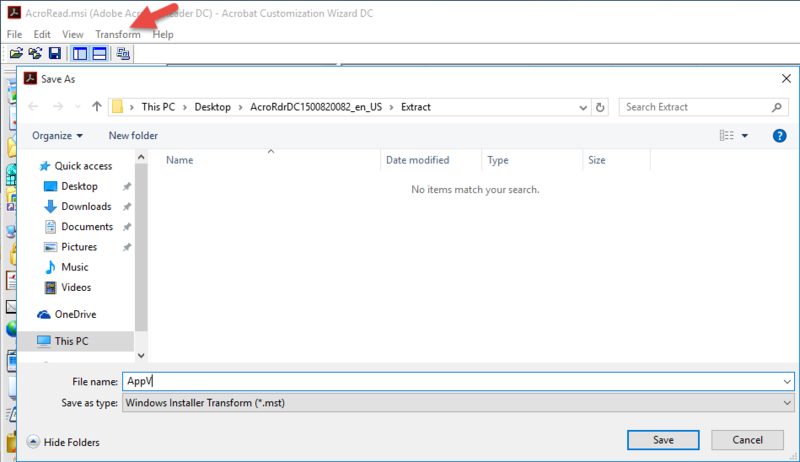 And my buddy Nicke Kallen wrote about the full Adobe Acrobat XI version recently here, so maybe he’ll tackle the DC Pro version next. Second, I will mention that I think you would be nuts to think about putting it on Windows 10. While I hated Microsoft’s embedded pdf reader on Windows 8.1, the Windows 10 version is pretty good for most purposes. Especially in the Edge browser where you don’t get plug-ins anyway. But most of you are still interested in getting apps on all of those Windows 7 machines, so here it goes. Adobe has gotten pretty good at deployment options lately. And they have been doing a great job of working with the App-V team at Microsoft, so there aren’t any big issues in sequencing it. But how about some steps of what to do? 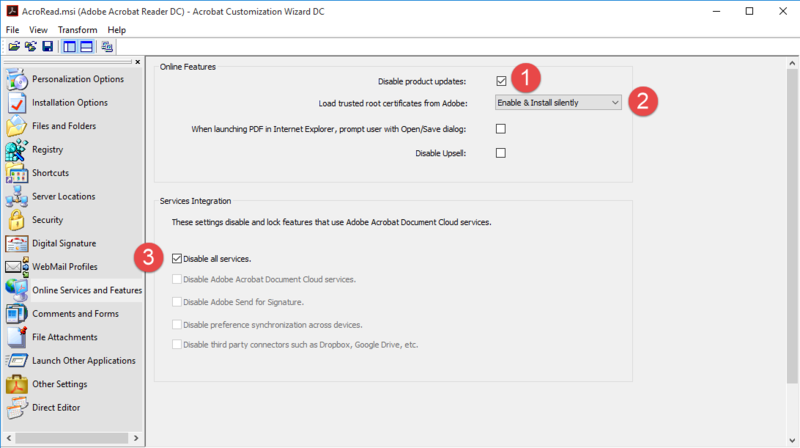 If you want to distribute Reader, or a handful of other Adobe products, inside your company you are supposed to apply for adistribution agreement. This is a pretty simple process. You fill in a web form and a short while later you get an email back. But in addition to making you legal, the email also gets you access to the full downloadable installers. You want to download those. Just go to the Adobe site and search for it. 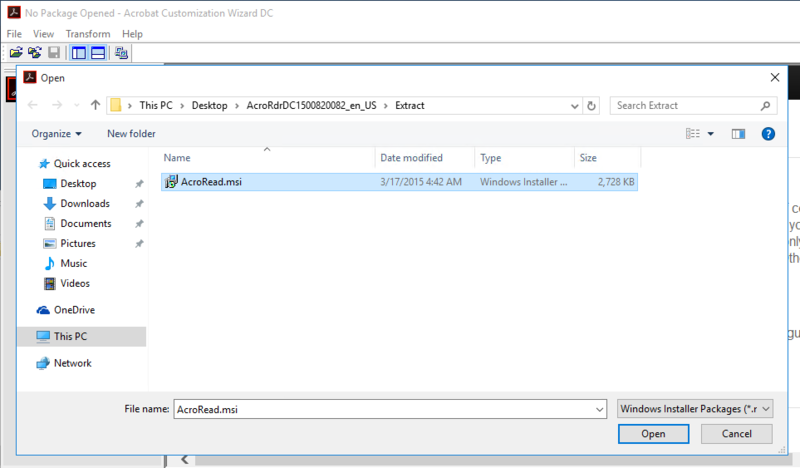 This tool makes it easy to customize the Reader installer before you get to the sequencer. Just be sure to get the copy for the version of Reader that you intend to sequence. I prefer to start the process on a clean sequencer – but only because I know that it is a clean machine. We’ll revert the machine before sequencing so it is OK to dirty it. 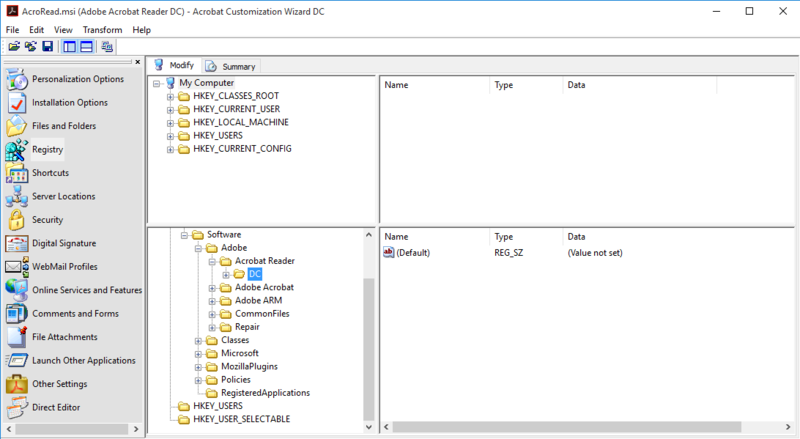 The documentation explains that you should start by unpacking the exe based installer they supply to get at the MSI files inside. The instructions didn’t work for me (possibly outdated for the DC version) so here is what I did. I downloaded a copy of 7zip and installed that on the sequencer (you could also use any other tool that can crack open an exe installer). 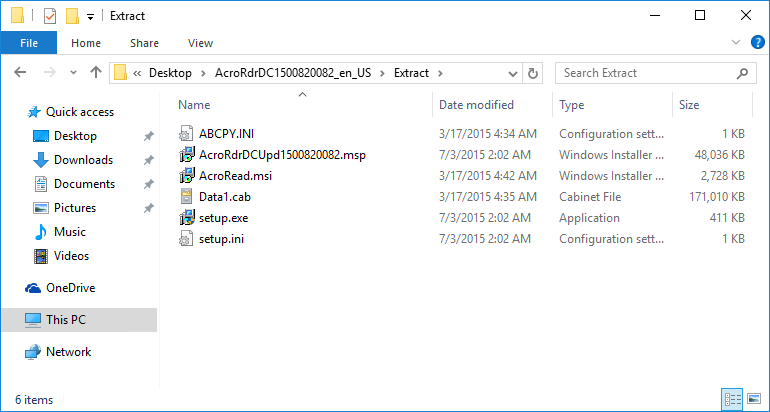 Open the file and extract the contents out into a folder on the desktop. You will find both an msi, the installer for the major version, and a msp patch installer. The latter changes on the minor updates. 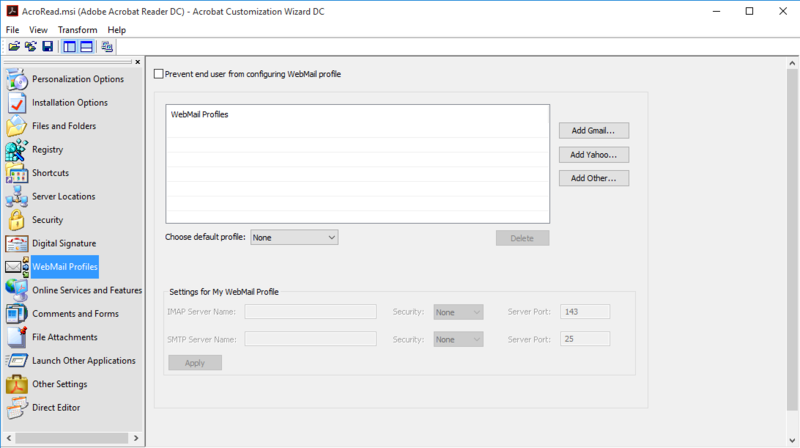 We will use the Customization tool to work just with the MSI and create a MST transform file that can be applied. 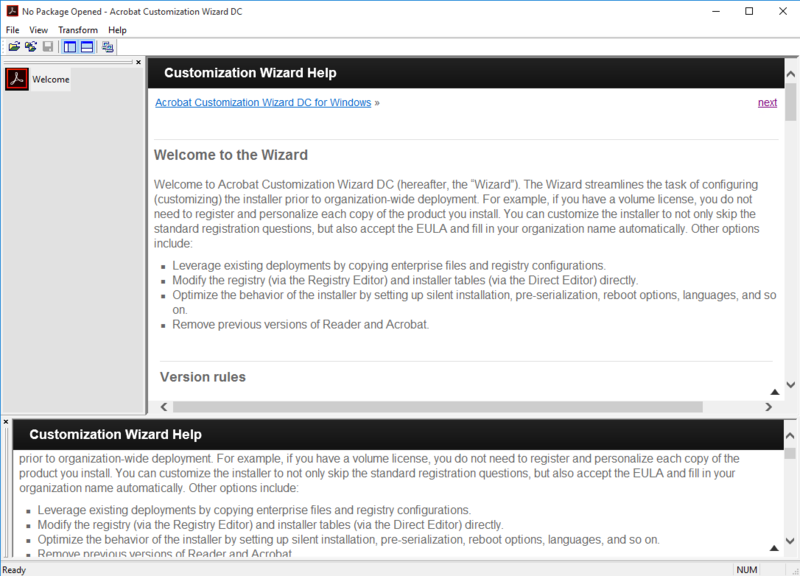 Using the Customization Wizard tool, open up the msi file (don’t worry about the warning in the documentation about starting in another folder, we don’t care). On the left hand side is a menu for customization areas. Clicking on one will scroll the documentation window to the appropriate page. Some pretty good detail is there to explain things, so I’ll just cover the things you most likely want to change. 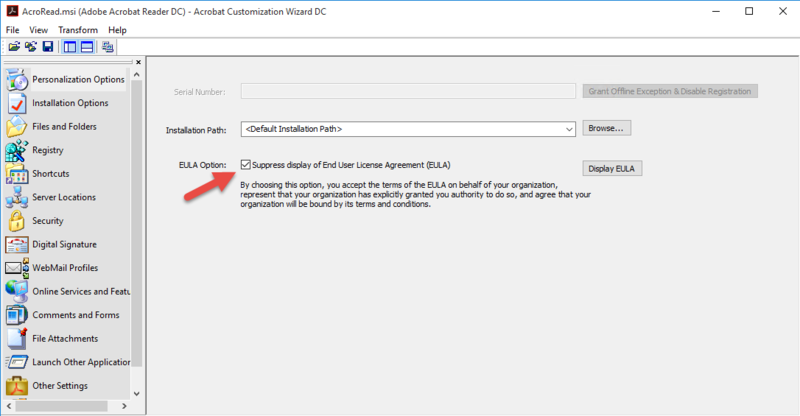 On the Personalization Options, most packagers will want to accept the EULA once now and not bother end users with it. I prefer to make the software the default reader. I also want to uncheck the Enable Optimization feature as I don’t want defragmentation on the sequencer. I used to let the installer cache in the package for possible self-repair, but since App-V 5 won’t let executable components be written to, you are better off unchecking that box. I set the Run Installation setting to Unattended, but that is a personal choice. The Files and Folders is one where you probably don’t have to do anything. There are some vc runtime files that will be installed if not present on the system, but App-V will have those covered so they won’t appear in the package. Similarly, you might not need to do anything on the Registry page. 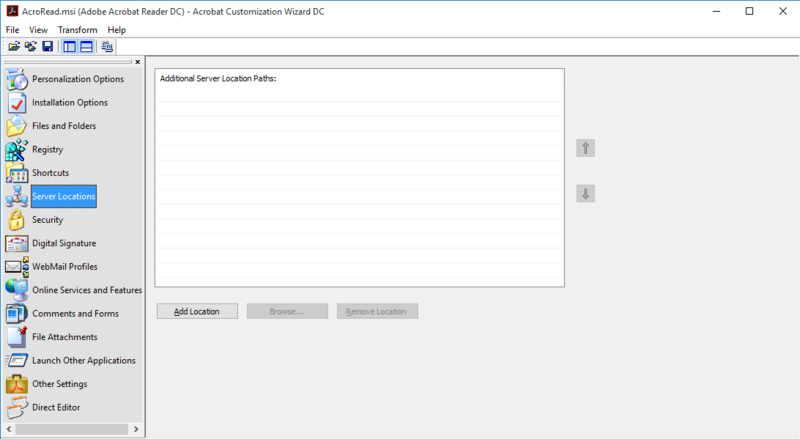 The exception would be when you find it easier to install and configure the product first, then extract the registry settings. Sometimes that is an easier way to make sure you get things like the security settings right. If you do that, just add the entries on this page. 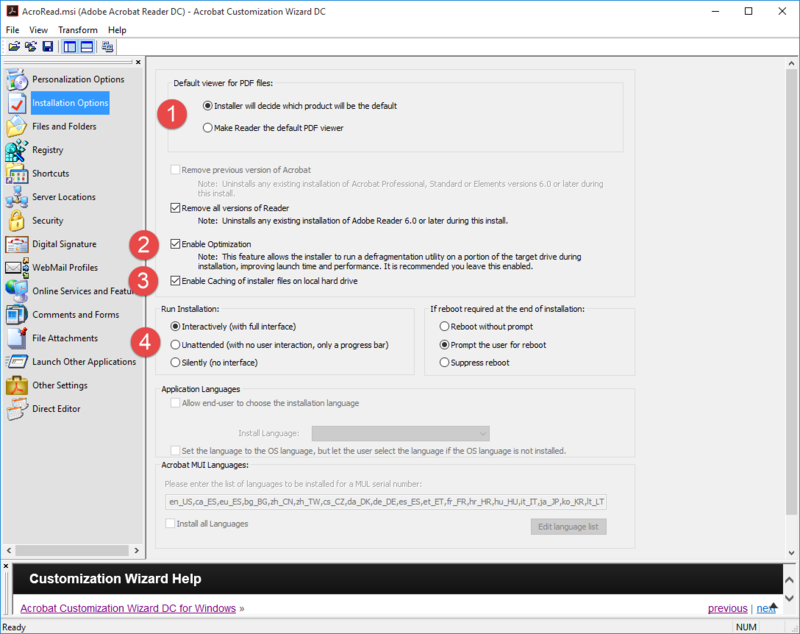 On the Shortcuts page of the wizard, you probably want to remove the desktop from the shortcut (right click on the shortcut and select remove). Skip the Server Location page unless you know that you need to add something here. Do something on the Security page. Setting up the security options is really important at some companies, others will just skip this page. If you skipped over the Security page, skip over the Digital Signature page also. I’m sure some customers care about the WebMail Profiles, but suspect that those customers are using the Pro version. If you don’t know why you want to make a change here, move on. On the Online Service and Features page, I start to grumble. The idea behind DC version is that you can do a lot more than just read PDFs. But all of those other things are online, cloud based services. And you have to pay for them. The Pro version includes all of them, but users can purchase a subscription to just what they need, like convert a PDF to Word, rather than the whole suite for something like $2/month. While it might seem that doing checking the to Disable checkboxes (1 and 3, below) might get rid of this, it unfortunately does not. 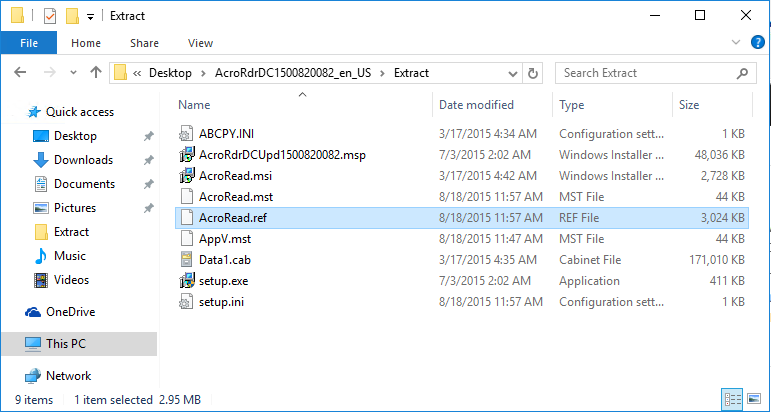 If you want to eliminate those features you probably need to find an older Adobe Reader to install instead. The Comments and Forms page covers those features. If you select the Auto Complete option, keeping the Remember checkbox unchecked for numeric fields is a good idea to prevent the user from accidentally storing PII data like phone, account, and social security numbers in their profile. The File Attachments page is interesting. 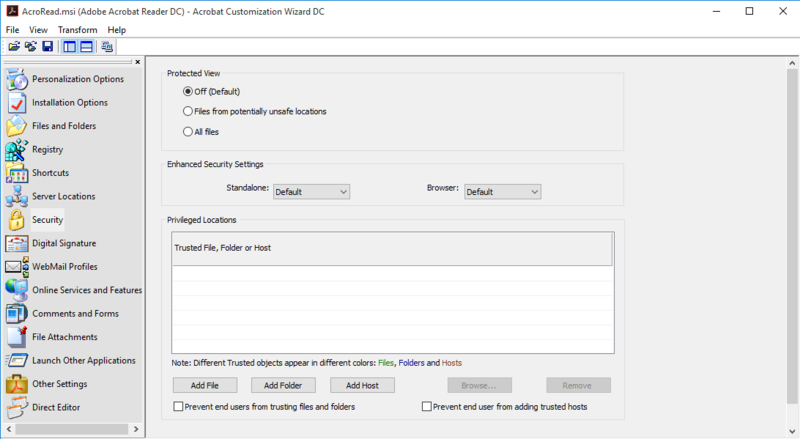 The defaults are probably fine, but it shows how Adobe has had to react to exploits allowing executable components to find their way into PDF files. Edit the Launch Office Applications page if you need this integration, which is rare. If you need this, you should probably have installed office before running this wizard. On the Other Settings page, you can set this feature to save ink when printing PDFs. Adobe seems to think this is a good idea, but it is just another reason for a help desk call. The Direct Editor page allows you to directly edit the MSI tables. You probably don’t need to. 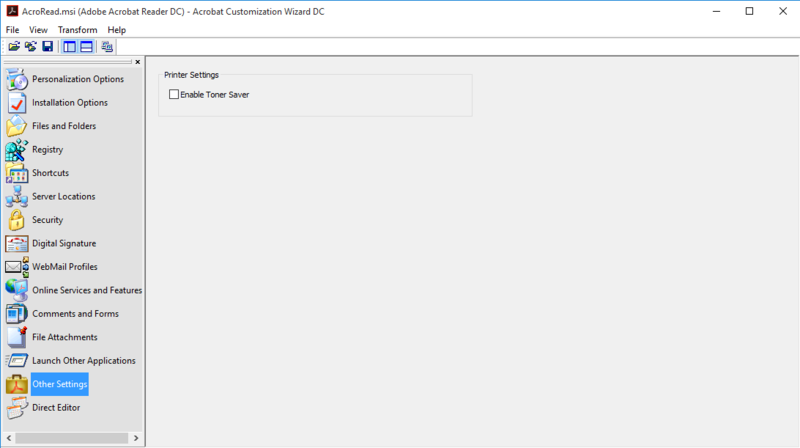 One example where you might chose to is to disable the arm updater service. We already disabled the updater, but making sure the back-end service is set to disabled will reduce some overhead. 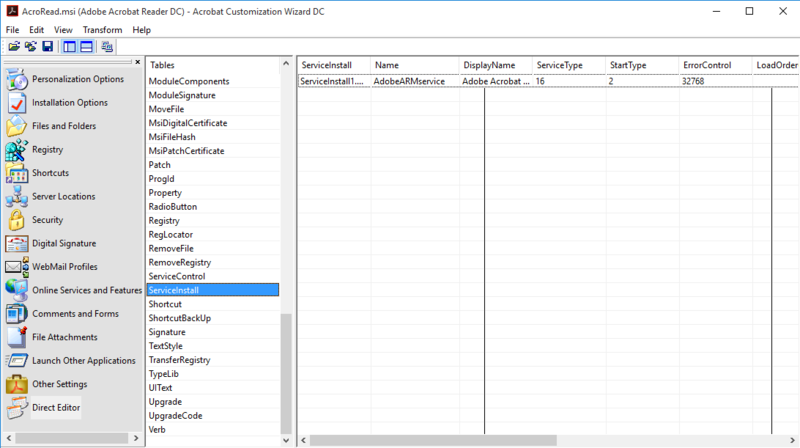 Just set DISABLE_ARM_SERVICE to the value 1 is one way, but setting the StartType to the ServiceInstall table entry (shown below) to disabled is another. I’m sure there are a bunch of other things you can do to tweak the installed package further, but this covers the basics. When you are happy, it is time to save off. You don’t need to do this, but I used the Transform menu to save off the MST file. 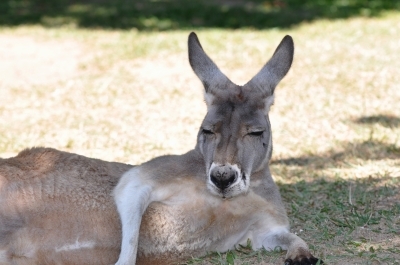 I named it AppV and just placed it in the same folder. Technically, it is possible to create individual Transforms to set individual items, and then chain the MSTs together in the combinations you need. While an interesting concept, it probably isn’t worth the hassle and you should just have one MST to link in. What you should do is what I did next. I used the File menu and saved in the same folder also. This created an mst file with the same name as the msi, plus it also edited the setup.ini file, so you won’t have to remember the syntax to run the msi with the msp and mst on a single command line. Here are the updated files. I’m not sure what the .ref file is, but it causes no harm. 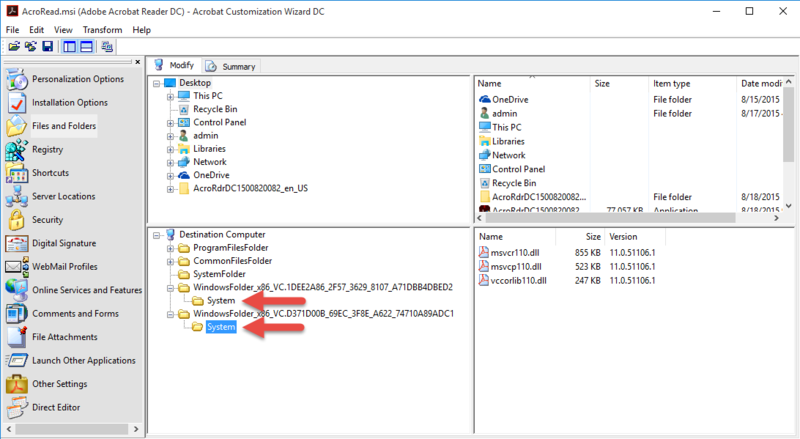 Save off this folder as your customized installer. You’ll want to pop it up to a network share as you’ll then revert the sequencer. The Sequencing is pretty straight forward at this point! Between pre-customizing the installer, and the great work done between the Adobe and App-V development teams, we don’t have issues today. You don’t need to PVAD the installer. Just run the setup.exe without arguments when in monitoring mode and your administrative install will complete without further input. I suppose you could set operating systems and not pick Windows 10, but otherwise no special settings or edits should be necessary, just save off the package. 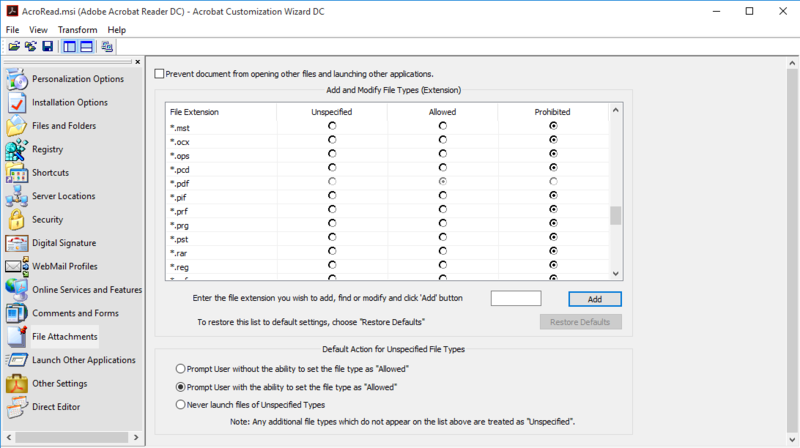 The Application Capabilities feature of the installer requires publishing globally, but you can probably live with hard coding of Reader DC as the default for pdfs. To get the benefits of browser integration, the browser must run in the virtual environment. 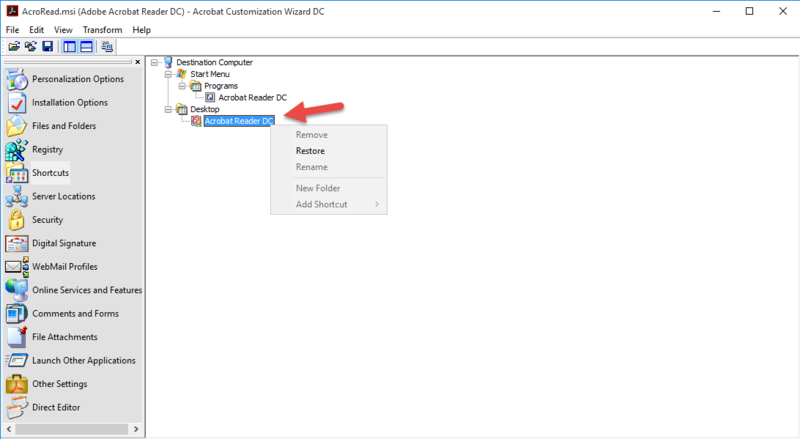 Without this, when the user clicks on a PDF on a web page, Reader DC will open as a separate application and window to display the PDF; with this the PDF displays inside the browser window using the COM interface connected via browser plugin. Connection Groups and/or RunVirtual is recommended.